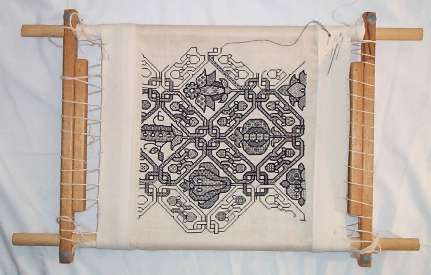 I promised to discuss a second logic for double running stitch. I call this one “accreted section” and use it for the more complex patterns, especially non-linear ones. If I were to use baseline, I’d start at a point on the outline, then work in the indicated direction, following the little detours as I came to them. But in this case there are LOTS of detours. It’s too easy to get lost. For example, If I were to start at the indicated spot at the base of the flight feather, then continue up to the wingtip, it looks like I’d be following the little striations on the first feather. Not too hard. 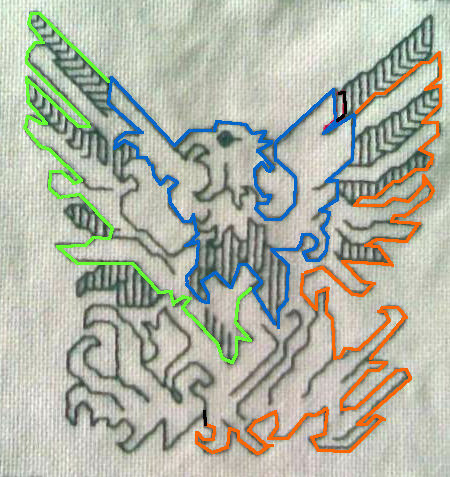 Little lines and hatchings like these make the pattern easier to follow because they can be easier to count than straight runs of stitching with few reference points to use for location verification. BUT I have a lot of possible detours. It’s very easy to start the feather with the stitch from the feather base to the first striation, then verge off down that bit of shading to the lower part of the wing and from there get lost in the body. Purists will note that the blue segment might be considered a baseline, with the other elements as detours off of it, but that’s quibbling. For me at least, parsing the pattern into three units helps keep me on track. 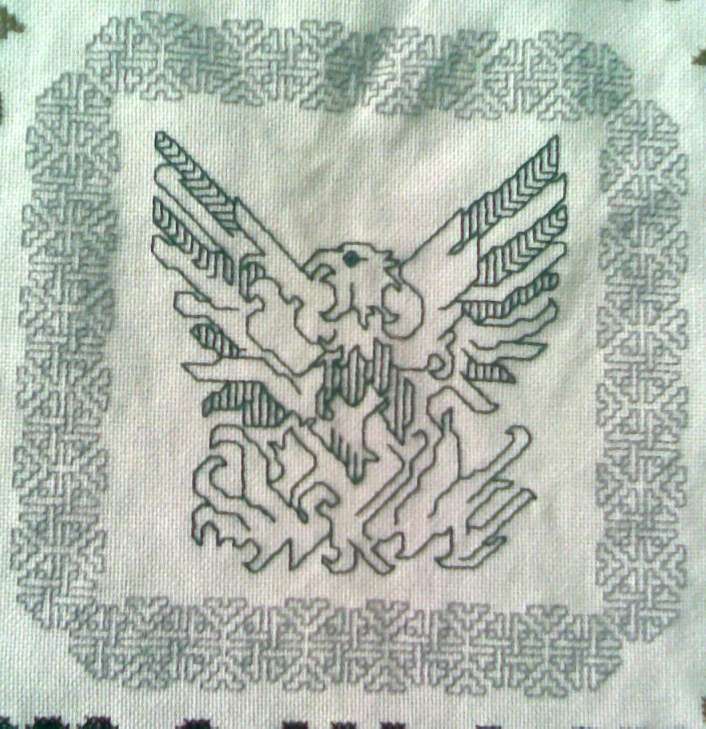 When I stitched this I started with the blue unit, working the bird’s neck and breast detail as departures from that line. I did have the luxury of not needing to do this piece double sided, so I did begin a new strand to work the green section, stitching the feather striations and other connected bits as I went along. The same with the orange section. 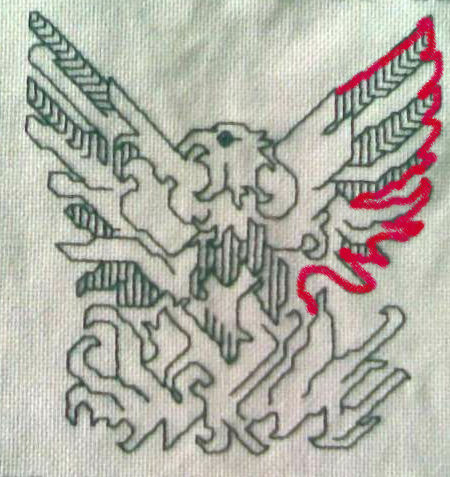 I did that last, again working the feather stripe and flame detours as I came to them. The flame section at the pattern’s bottom left is a closed loop departure off of the orange line. You can clearly see that I did that on this strip from Do-Right. I started with a baseline that outlined the flower, then on the second pass, filled in the petal details. In this case I worked using a hybrid logic. Instead of establishing one baseline for the entire repeat, I worked it more along the lines of the accreted method above – isolating the flower, then the branch from which it buds, and then the branch segment that connects this flower to the next (flipped) repeat. Being limited to the frame’s real estate lends itself to this compartmentalized, hybrid approach. 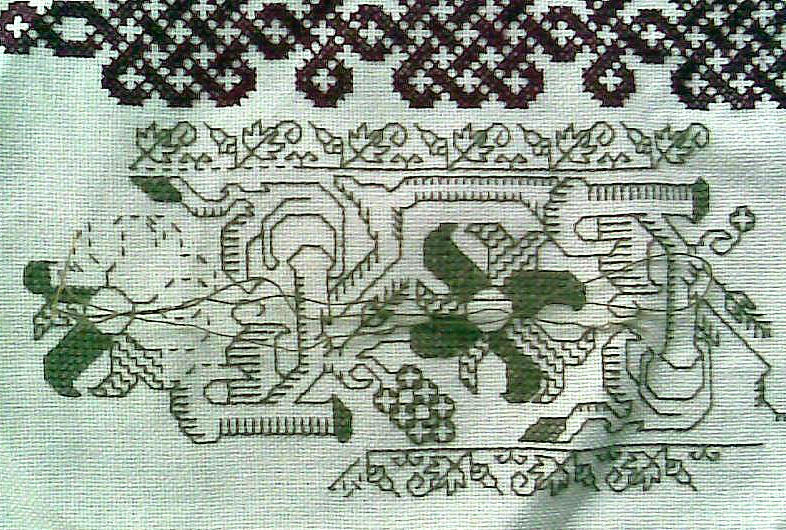 In any case, this concludes the series on double running stitch logic. Please feel free to ask questions. 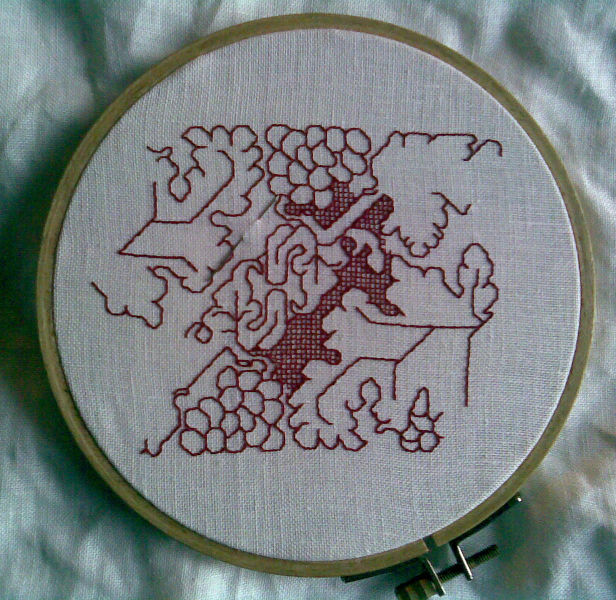 I don’t pretend to know it all, but chances are I’ve faced some of the same stitching problems that might be challenging you, and I’d love to help. English major twitch: "taut" =/= "taught"